"Let us consider the farmer who makes his straw hat..."
Widely acknowledged as the great American prose poet, Russell Edson was born in Connecticut in 1935 and currently resides in Stamford. Donald Hall has characterized Edson's work: "It's fanciful, it's even funny—but his humor carries discomfort with it, like all serious humor." Although Edson studied art in his teenage years, he began publishing poetry in the 1960s; he has since proceeded to publish more than 10 collections of prose poems and received fellowships from the National Endowment for the Arts and the John Simon Guggenheim Foundation. "Let Us Consider," included in his recent book The Rooster's Wife, presents the quirky and utterly distinctive tone of voice that has earned him a national following. Edson has remarked, "Writing for me is the fun of discovery. Which means I want to discover something I didn't know forming on the page. Experience made into an artificat formed iwth the logic of a dream." When asked about his well known reclusive nature in a 2004 interview, he responded, "'Hermit' is one of the ways of life one naturally falls into without even noticing it. A giraffe doesn't think of itself as a giraffe. It just happens to be a giraffe without having to think about it." 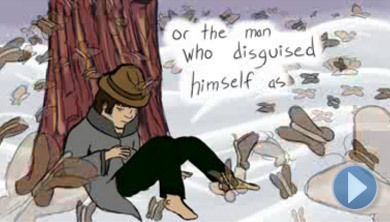 This animation was created by Chris Lightbody, and Edson reads. To read this and other poems by Russell Edson, as well as biographical information about the poet, please visit the Poetry Foundation Web site.